This is a great tool to give your students tons of receptive skills practice. 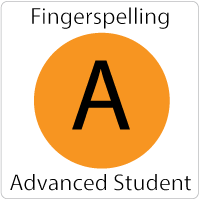 It is great as a supplement to ASL 3/4 classes or for a dedicated fingerspelling class. 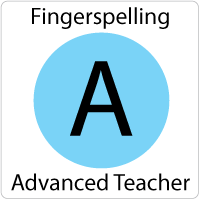 In this version all student work is completed online and automatically graded for you. This 19 module course will challenge ASL 3 students. All learning takes place by watching a native signer at native deaf speeds. 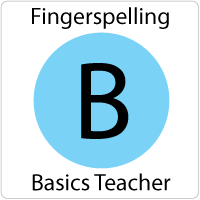 It is a complete fingerspelling course including printed lesson plans and classroom activities. This online curriculum includes the companion student materials. The following topics are covered: Travel, Categories, National Parks, Acronyms, Presidents, Weather, Technology, Outer Space, Midterm Preparation, Midterm, Home Improvement, Double Letters, Menus, Historical Locations, Job Titles, Medical, Legal, Final Exam Preparation and Final Exam.